It’s official. I’ve found the strangest bookshop in the UK. Congratulations to me. Cambridge’s Haunted Bookshop is one of the few bookshops in the world that is truly unique – the only one of its kind – and I love it. I’m massively intimidated by it, but I completely love it. While the Waterstone’s in Cambridge has a great selection and a plethora of inspiring titles, it still looks exactly like my local Waterstone’s in Islington. And the one in Trafalgar Square. And the one at Gower Street. Even Cambridge’s own independent bookseller, Heffer’s (review forthcoming), looks exactly like every other branch of Blackwell’s, the major chain that now owns it. There are a lot of up-sides to this gentrification of everyday life; it makes us comfortable enough to go into a bookshop anywhere in the world (or at least the country) because we know it can’t be all that different from the one at home. And in this day and age, any method towards the end goal of getting people into a bookshop justifies the means. But I think there’s also a lot that gets lost when the slightly different, thoroughly quirky and downright bizarre are edged out. Haruki Murakami wrote that ‘if you only read the books that everyone else is reading, you can only think what everyone else is thinking.’ Surely he could just as easily have warned us that if you only get those books from Amazon’s Top Ten List or – worse – the Books section at Tesco (shudder) your bookshelf will look the same as everyone else’s. And your stories will be the same, too. That said, I would love to meet someone whose local go-to bookshop is this tiny, cramped little shop in St. Edward’s Passage. What if this was the place you always went when you fancied a browse, if this the collection of books you had to work with whenever you needed a lit fix? I’d imagine that the bizarre combinations your bookshelf held and the stories of hunting, finding, losing, sharing, wanting, coveting, considering and surrendering that those books told about you would fill many pages themselves. But enough of my philosophising. There’s a bookshop to be fawned over. First of all, it seems like the shop has two names. Fine. Why not? 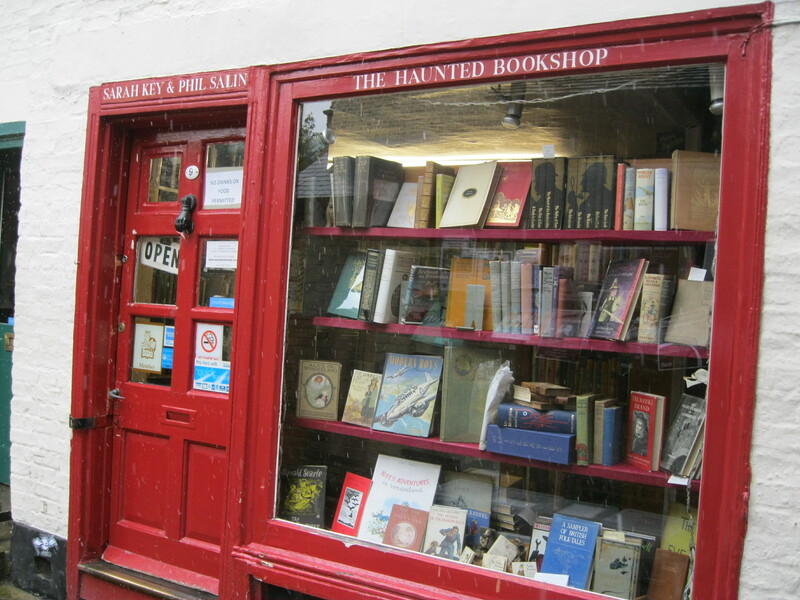 As it turns out, Sarah Key Books (named, no doubt, after a woman called Sarah Key) specialised in secondhand and antiquarian books and particularly in children’s literature for years before it found its current home at what is called The Haunted Bookshop. Unfortunately I do not have any answers as to how, why or by what it’s haunted. I mean I could of course go all humanities student on you and say that it’s haunted by the voices and stories of writers and readers past. Which, you know, I’m pretty much convinced it is. But I’ve been waxing poetic about dog-eared pages a little too much of late, so I’ll refrain. The other possible haunting is the palpable presence of the owner, sitting behind her desk, head popping up from between piles of books, who almost seems to wish that you’d leave her alone and let her get on with it. It’s kind of a Bernard Black situation. Although once you actually go talk to the staff I promise they’re much lovelier than Bernard Black. The collection of secondhand and often first editions of classic children’s books is absorbing. From Matilda to Harry Potter, from Enid Blyton to Hans Christian Andersen, from Alice Liddell to Snow White, every child and every childlike adult is covered. Beautiful illustrated hardcover copies and tattered paperbacks range from £4 or £5 to roughly £1500, for something like, say, a first edition of Prince Caspian. For those of us who will probably never have the kind of disposable income required to do more than pick up and maybe sniff these books (if you’re feeling cheeky) it’s like the trials of Tantalus. Children’s books aren’t all that’s on offer though; the Folio Society editions make their appearance too, as do various editions of classics. I had my eye on a copy of one Sherlock Holmes novel or another, as well as a FS edition of Wuthering Heights. I refrained from buying anything, to my dismay and my wallet’s satisfaction. Despite not going home with any of these beautiful books, I still felt glad to have found this strange and wonderful little place today. Like Alice falling into Wonderland, or Harry landing in Diagon Alley, walking into the Haunted Bookshop is like stepping through a portal. It’s like being transported back to a time before global monopolies (yes, I’m cross with Amazon for buying Goodreads; I promised not to rant about it), super-chains and clinical, sanitised spaces where no one is ever challenged and nothing new ever happens. It makes me glad to live in the UK because it seems to me that while so much of the world just steps in line and lets the strange and quirky and unpredictable fade out of their lives, some people here (few and far between as they may be) still put up a fight for their weirdness. Sarah Key Books: you’re one of a kind and I hope you never stop fighting to stay that way. This entry was posted in Cambridge and tagged Alice in Wonderland, Amazon, antiquarian books, antique books, book-hunting, books, bookshop, bookshops, bookstore, bookstores, Cambridge, Cambridge bookshop, cambridge cb2, children's books, Harry Potter, haruki murakami, haunted bookshop, I Hate Amazon, I hate Kindle, independent bookseller, independent bookshop, independent bookshops, independent bookstores, kindle, literature, narnia, reading, Sarah Key Books, Second hand, second hand books, second hand bookshop, St. Edward's Passage, The Haunted Bookshop. Bookmark the permalink. Does the name have anything to do with the novel by Christopher Morley, The Haunted Bookshop? He published it in 1919. I remember it because it was a mystery store that the librarian in the small town where I grew up thought I would enjoy it and I did. I think it might just! There was a copy of it in there, so it may be some kind of homage to the book, but I just don’t know. Quite possible though! You are lucky that pockets of quirkiness still exist in the U.K.! I noticed that I can find quirkiness in big cities or far out places and being in the latter situation, I am lucky to be close to two fine independent bookshops. …. (Amazon bought GoodReads?? ARG). Absolutely LOVE the Murakami quote! Here in Toronto, Canada yet another gem of a bookstore closes its doors tomorrow. We no longer have Nicholas Hoare’s wonderful assortment of divine books, atmosphere perfect, knowledgeable staff. A place to browse and poke about, a place worthy of any booklovers time spent amidst the wood panels. I love this bookshop. It is the one I go to most for secondhand books. I have purchased a number of children’s first editions from the cramped little room upstairs, which is actually quite a challenge for someone of my stature. 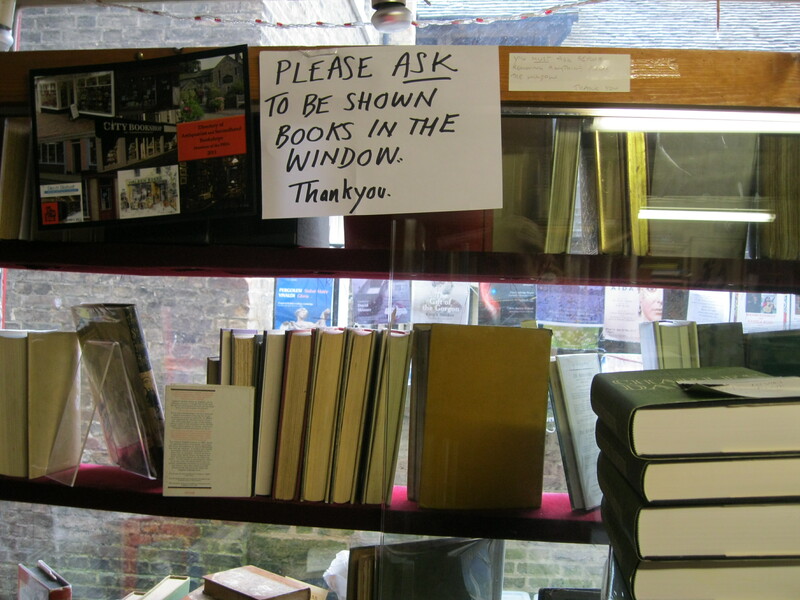 I am loving your series on Cambridge book shops. Thanks. Looks so beautiful from the outside and inviting from the inside. I am really enjoying your posts…I know regret taking the opportunity to visit (or find) these shops to explore when I travelled to London. But now I have something to look forward to…(better start saving). Definitely one to be added to my list of bookshops to be visited – looks like quite the little cave! This place sounds and looks great! I will have to remember it if I’m ever in Cambridge! Great, eerie post! What a find. I totally want to go there! Have you ever been to Shakespeare and Company on the left bank in Paris, or its sister bookshop City Lights in San Francisco? Both similar in spirit to what is pictured here, though larger. At Shakespeare and Company they even had nooks and crannies with desks and typewriters (and even places to sleep!) for wandering writers. City Lights used to receive mail for people who were without another address; not sure if they still do. Both places came to mind when I read your post. “Strange and wonderful” is a great description. 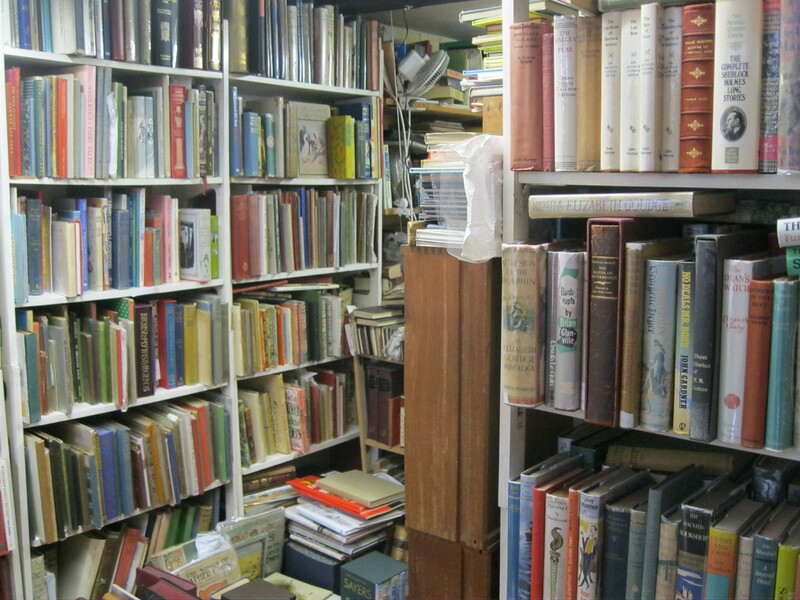 This post brought back happy memories for me – I found this bookshop on a visit to Cambridge a couple years back, and I found so many lovely books, especially some books from authors I had only half-remembered reading as a child. I knew I couldn’t take everything I wanted, because I had to travel light on the train back to London that evening – but how tempted I was to buy a wheelbarrow. On the basis of your recommendation, Emily, I visited this when recently in Cambridge (it was past closing time when I saw it on a first visit) and wasn’t disappointed. Especially impressed by the selection of classic children’s books upstairs and the fact that you could get William books at the bargain price of £1 each should you have gaps in your collection. Sadly more recent authors seem not to be hugely in evidence, but it’s still an impressive shop. By the way, the gentleman behind the counter was certainly very friendly and chatty. I stumbled upon this bookshop just before closing time thirteen years ago, and it was like stepping into a dream. Deep, shadowy dusk outside. No one else inside except the man at the counter. Dusty, heavenly books that triggered spooky, half-memories from childhood, the double-thick stacking, the tiny, creaking stairs, etc. And then in the final corner, stuffed behind other books, lay an early edition of an E. Nesbit book (Story of the Amulet), which is something I’ve never found in the US. It’s my treasure. 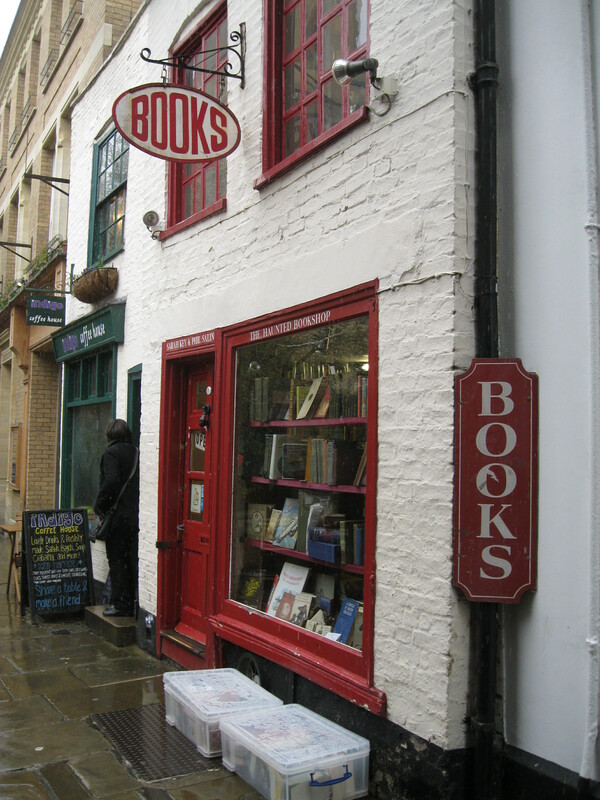 Ever since, I’ve thought of that bookshop with its lone red and white beacon on a narrow lane as the magical bookshop (that might just disappear by day). I didn’t know it was called The Haunted Bookshop until today, but that fits it quite well.